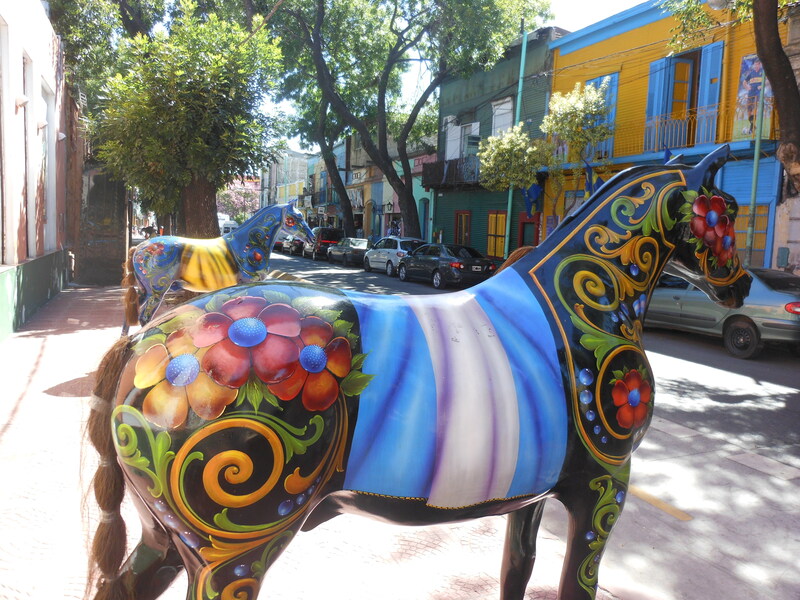 As part of our South American summer cruise, the family spent two days in the Argentine capital of Buenos Aires. While we saw many more sites than the subject of today’s posting, I wanted to take this space and highlight one of the locations we spent a chunk of time at. 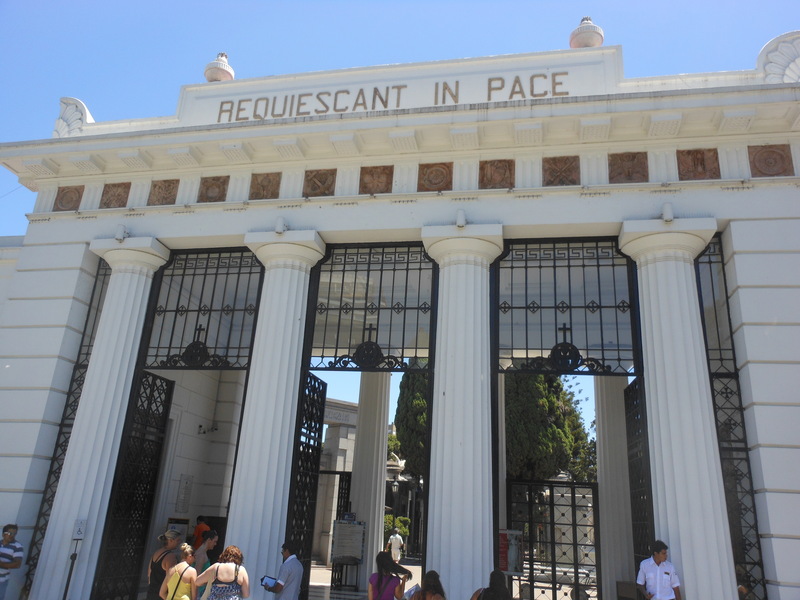 For those of you playing at home, this final resting place belongs to Marcelo Torcuato de Alvear (1868 – 1942), who was a lawyer, politician, ambassador, and whose name scores thrity-three points in Scrabble. The following picture will not do justice to my next description, but this entire cemetery is crammed and packed with stone crypts. Sometimes the paths to and from graves were only wide enough for one person to walk through – which tended to be an issue when large tour groups came filed their way through. We came across this interesting pair of crypts. I must admit that when I think of a mausoleum, my picture of it is a place that remains static. 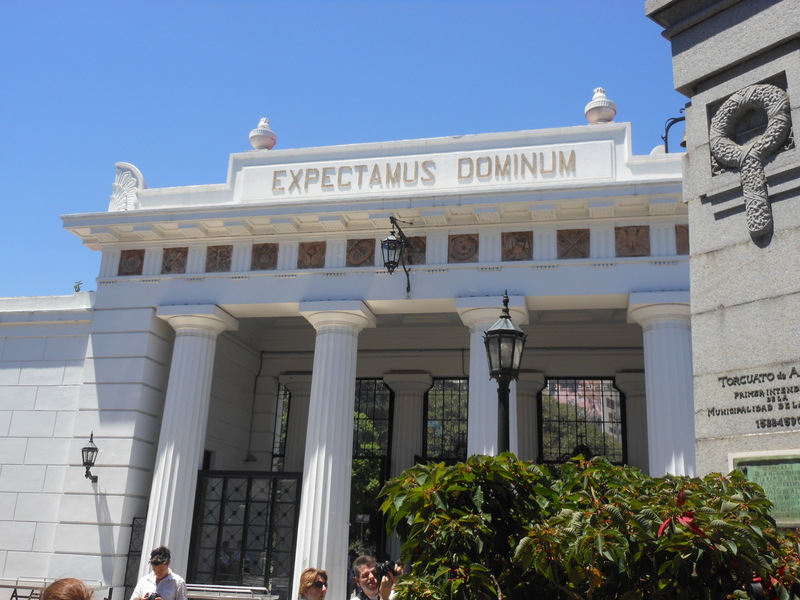 I never really thought that a place like La Recoleta would allow new tenants, but I was wrong. 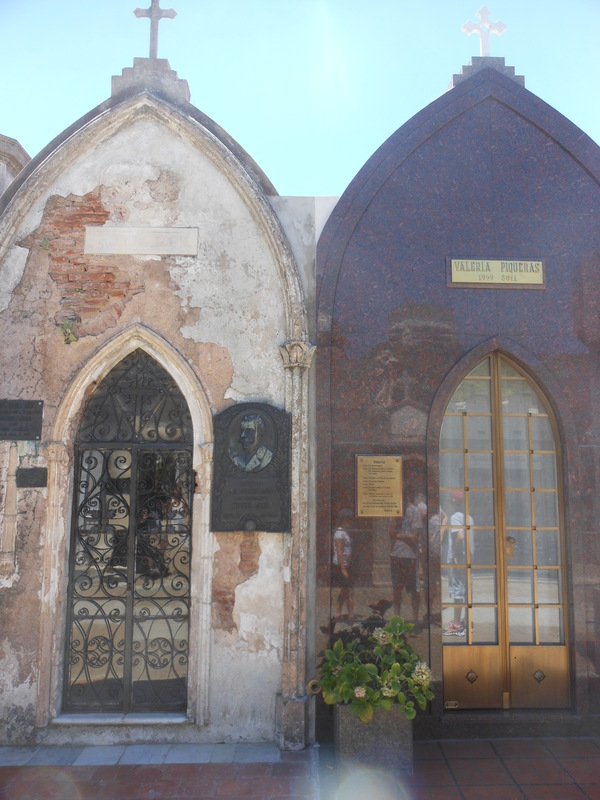 In the picture below, the crypt on the right is from 2011 whereas the one on the left is from 1905. 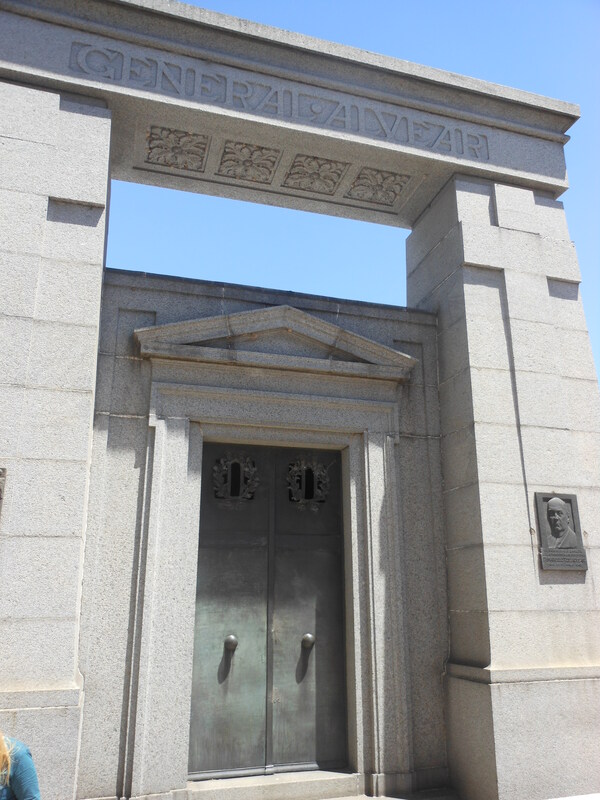 Since I can’t imagine that there had been an opening just waiting for the 2011 crypt to be built, it did make us wonder who was evicted to make room for the new burial…and where are their remains now? 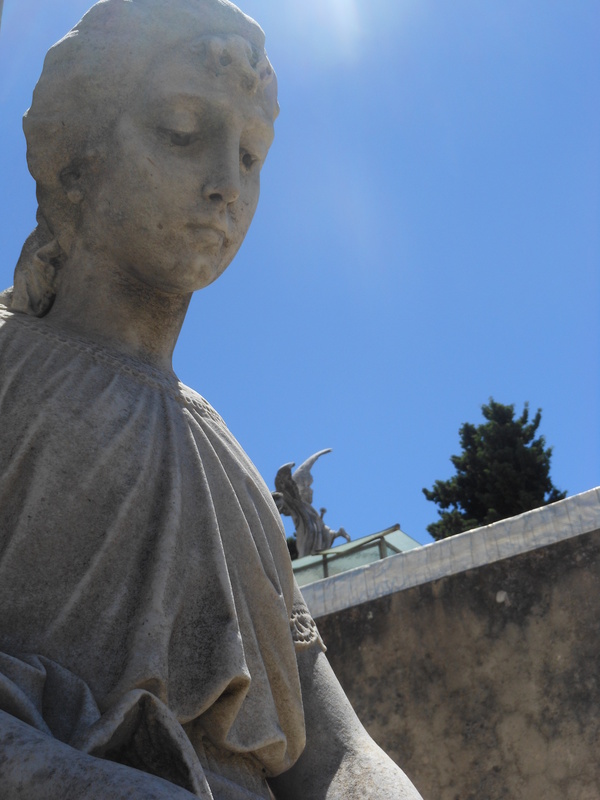 Despite being surrounded by marble, stone, and corpses, this place did manage to keep the interest of our two boys. They have recently become fans of the British television series Doctor Who and we spent a good deal of time walking around the statues telling each other not to blink. For those who have not the wonderful pleasure of watching the Doctor Who episode “Blink“, go here. 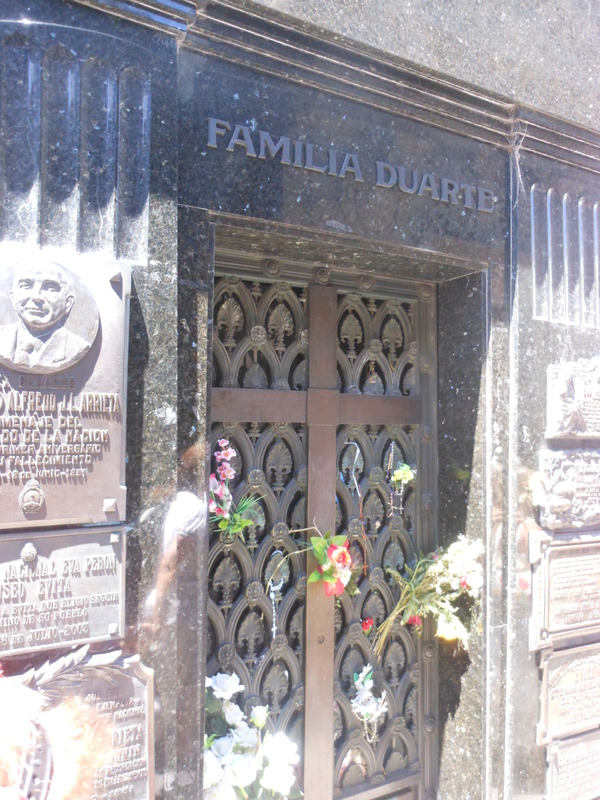 While it is crowded in La Recoleta and there are famous Argentine folk buried there, this place is renowned for being the final resting place for one person in particular. 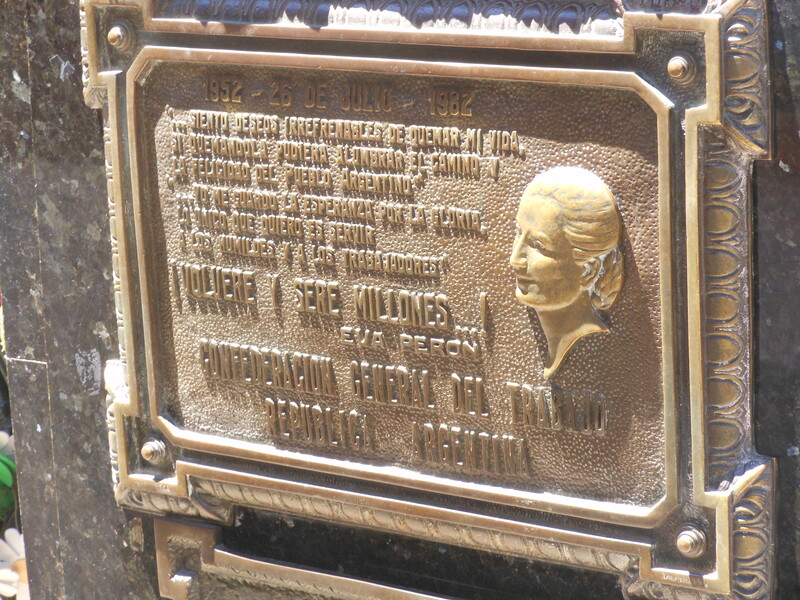 Above is the grave of Eva Peron. 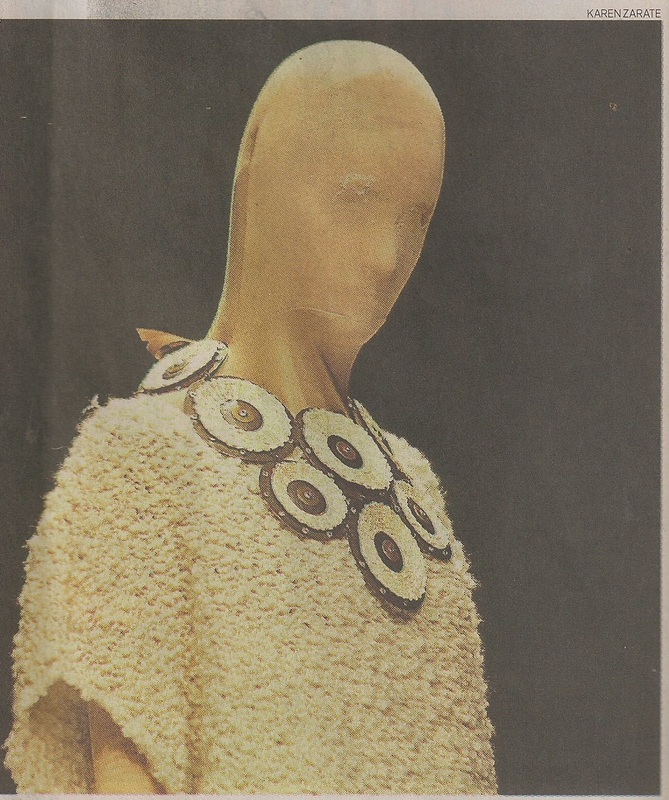 For more, non-musical, information about her, you can jump here. 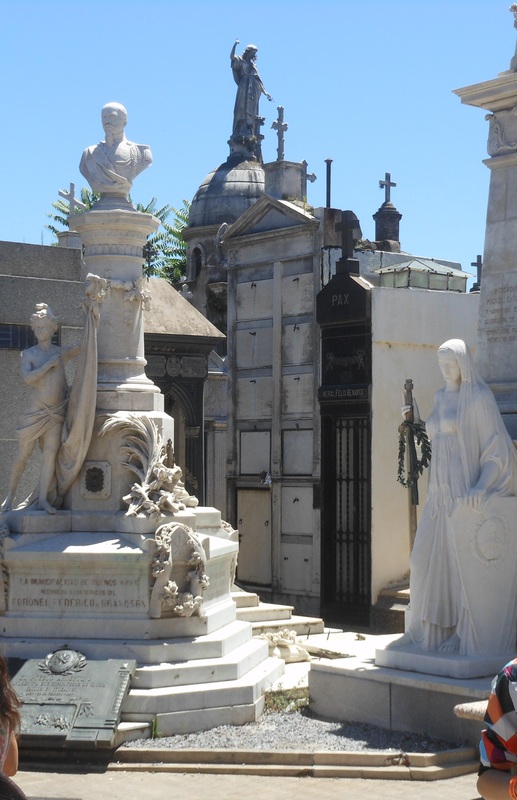 The line to walk past her crypt was long and – because of the crowded nature of the place – single-file so it took some time…but well worth it. After a few hours, we were done. As we left, this was the message presented to us as we emerged back into the land of the living. My Latin is even worse than my Spanish, but Google Translate reads those two words as “We expect the Lord” or “We wait for the Lord”. And with that lovely thought in our head – you will die one day also (at least that’s how I read that message)- we continued our vacation. Over the Semana Santa (Holy Week) holiday during the Thursday and Friday before Easter, our family took the opportunity to visit some sights around Lima that we had not yet seen. 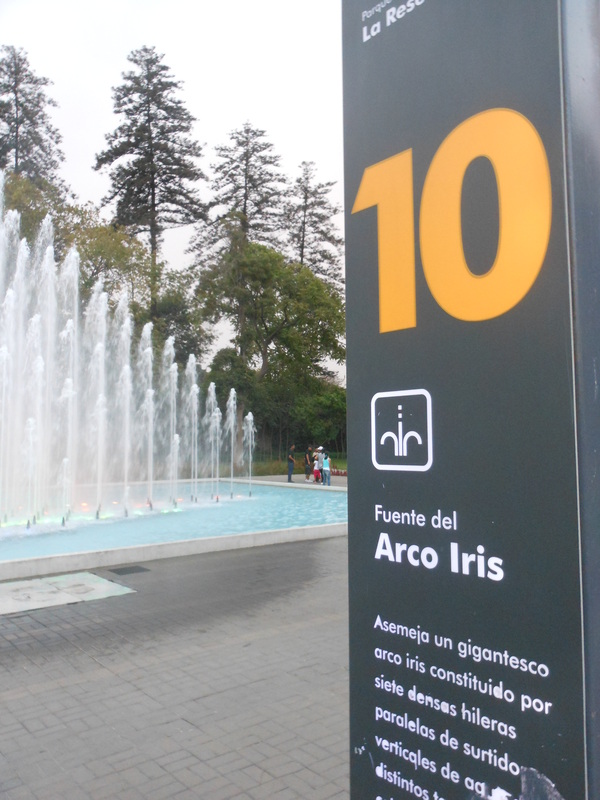 High on that list was the Parque de la Reserva (Park of the Reserve). 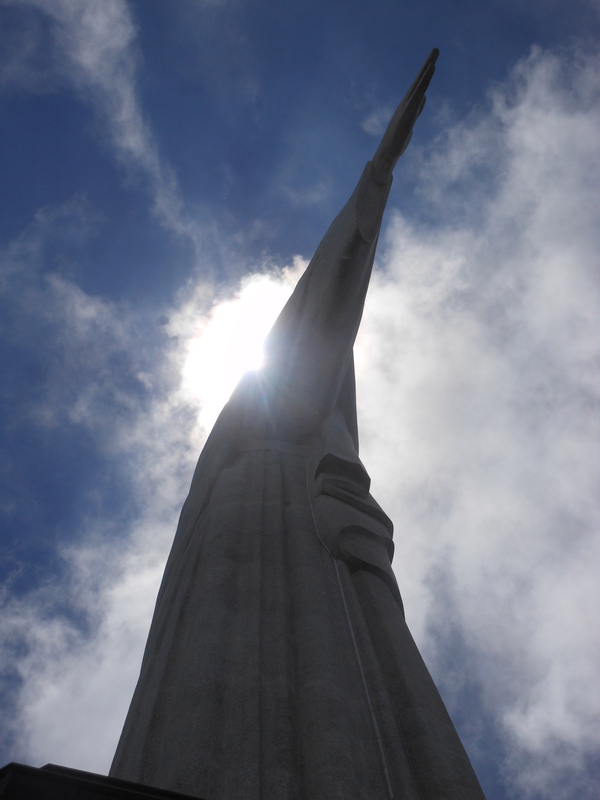 Completed in 1929, this public green space was built to honor those who fought in the battles of San Juan and Miraflores during the War of the Pacific (1879 – 1883) where Peru and Bolivia fought against Chile. As a side note, and to highlight the fact that some folks are still steamed over the outcome of that conflict (over a century+a score+a decade ago), the government of Bolivia has gone to the International Court of Justice (ICJ) to obtain the coastal land it lost to Chile. 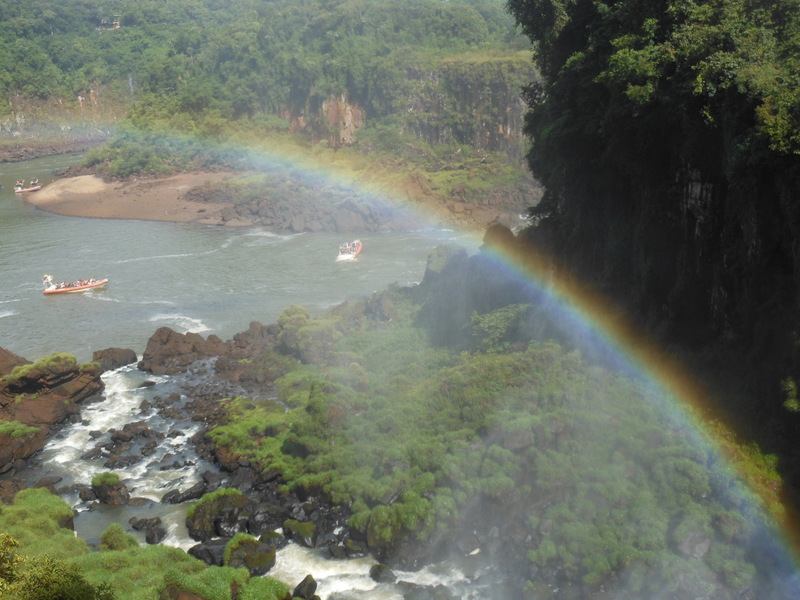 In other ICJ news, Peru and Chile are awaiting the Court’s ruling on Peru’s petition to redraw the maritime boundary between their two countries. 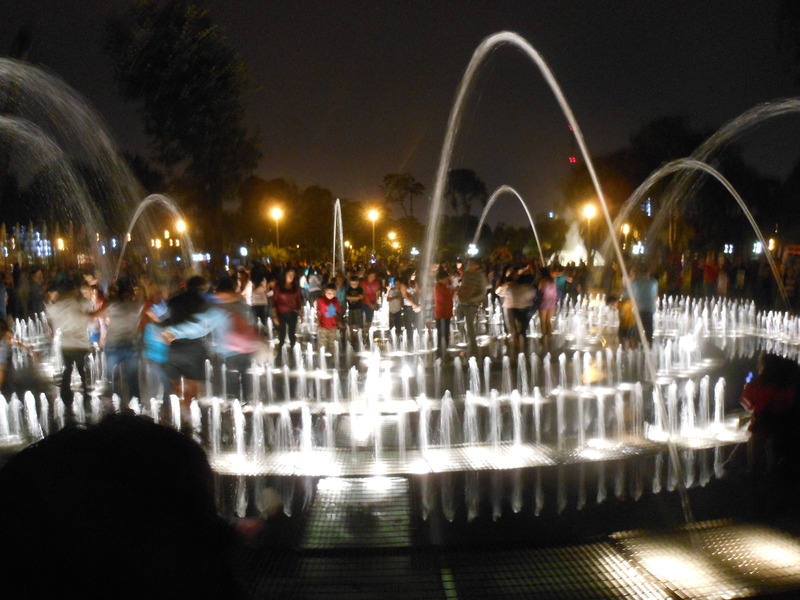 However, all of that judicial and military maneuvering flowed to the back of our minds as we enjoyed a lovely evening walking around the park’s signature feature, El Circuito Mágico del Agua (The Magic Water Tour). 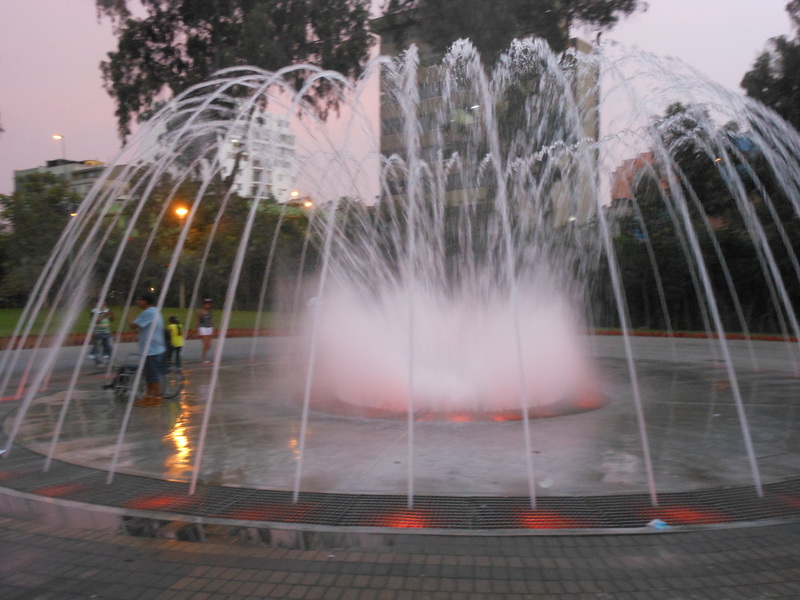 The tour is a series of a baker’s dozen of distinct and different fountains. Each one is numbered and named. 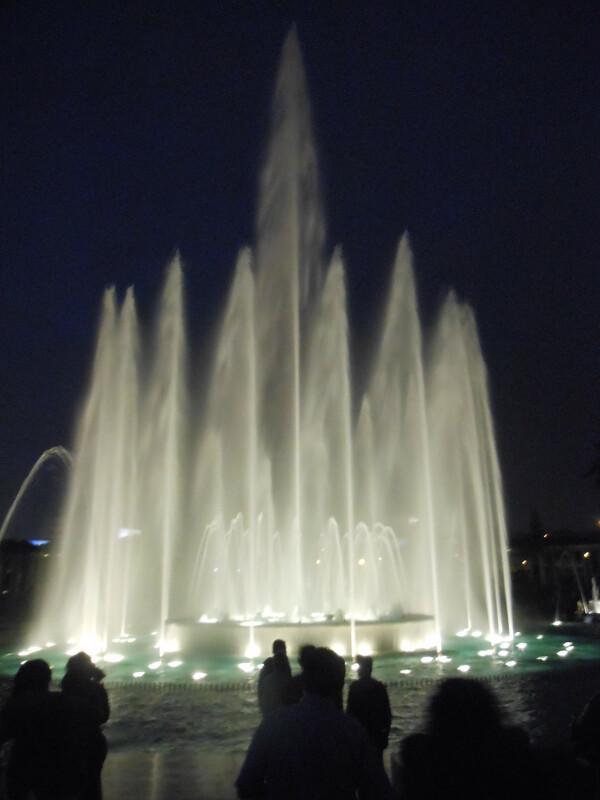 The Tour is best seen at night when the floodlights makes the dancing waters sparkle. We arrived near dusk. I also learned a valuable lesson for tourists. 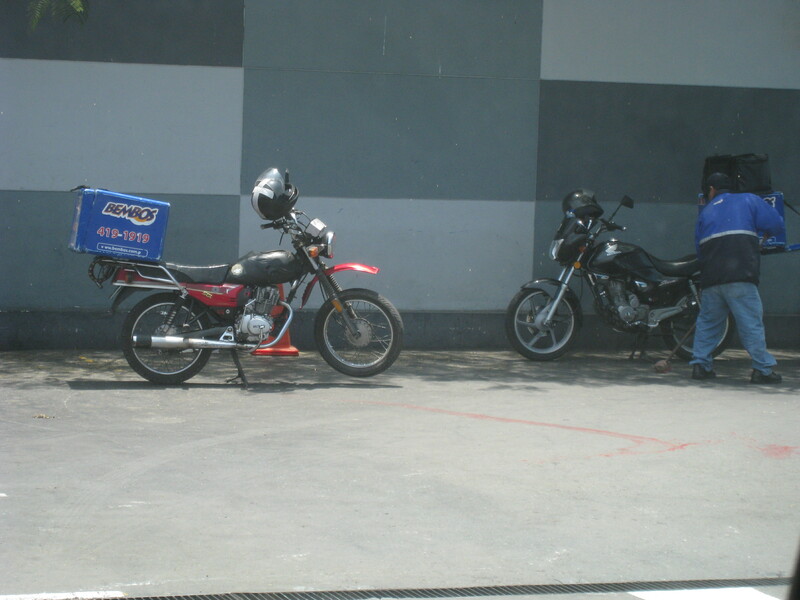 I learned that one needs to make sure that the battery in the digital camera is charged up before going on an outing. Sadly, I neglected to check the level of electric charge in my trusty camera and so right after I took the above picture, I was greeted with the “Recharge battery” message. Ignoring the mocking green letters on my camera’s screen, I was able to squeeze out a few more images (seen below) before my camera truly gave up it lithium-ion ghost. 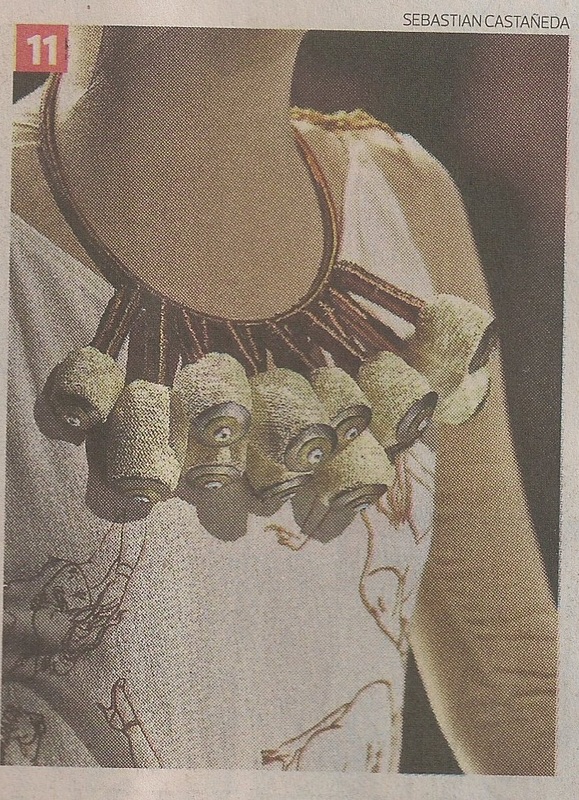 My apologies for the grainy, fuzzy nature of these photos. I’d like to say that I used some sort of Instagram filter on them, but as I said before, I had little battery life and so I only had a few seconds to turn the camera on and take whatever shot I could before my camera died. 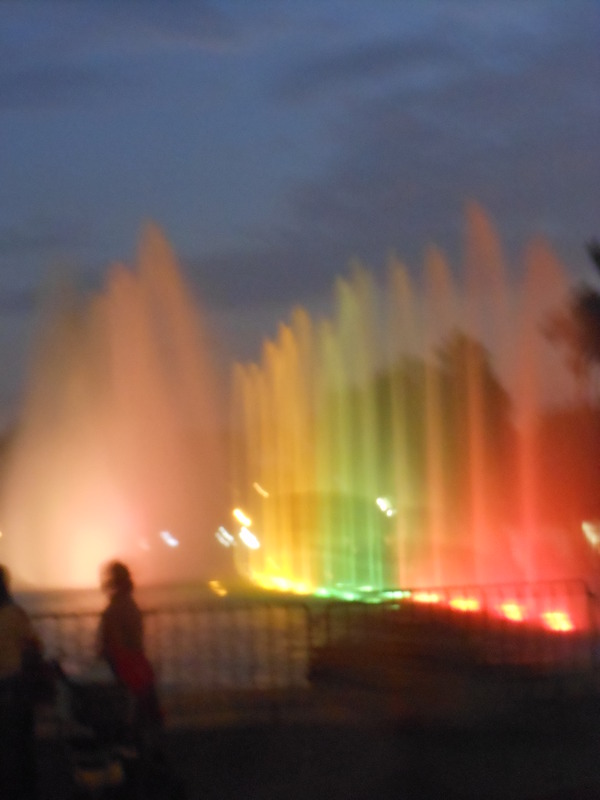 The above fountain, Fuente Magica, is the tallest of the thirteen. People are not allowed in it, but that doesn’t mean the fine folk of Lima couldn’t enjoy a cool blast of water on a March evening. 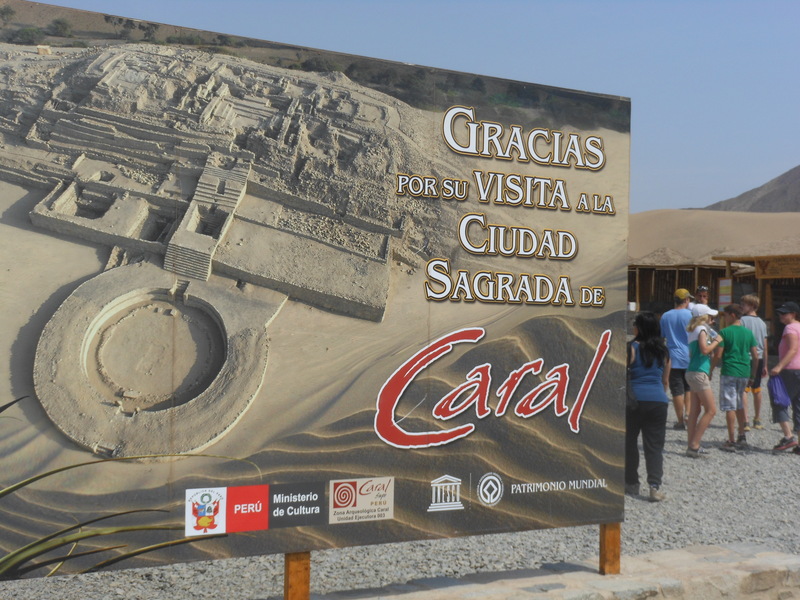 Two days later, we went from the wet to the dry as we visited Caral. So how did you spend your Saturday before Easter Sunday? We went to an archaeological site. 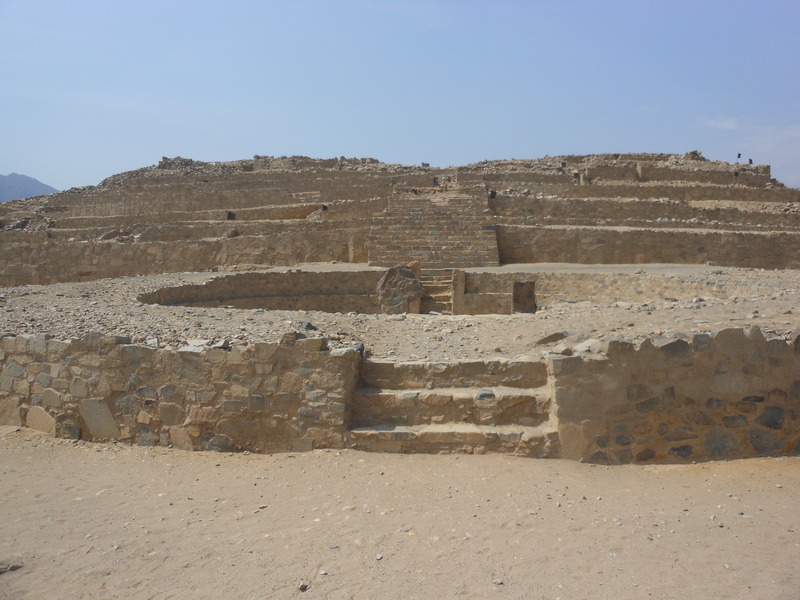 To be more specific, we drove north of Lima to Caral, considered to be the oldest city in the Americas. 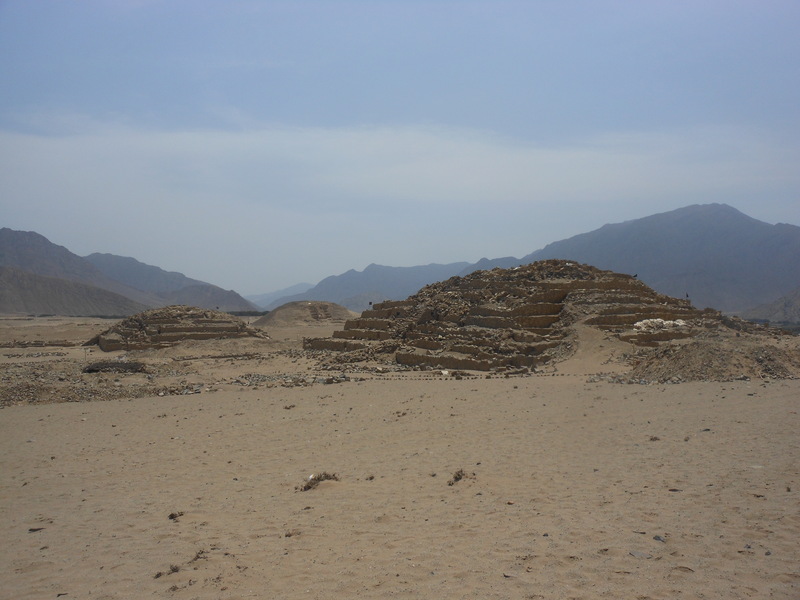 After a three-hour drive north – of which the last twenty kilometers was done on a road that had not been paved since Caral was last inhabited – we arrived. This is the entrance sign in all of its glory letting you know you have arrived. 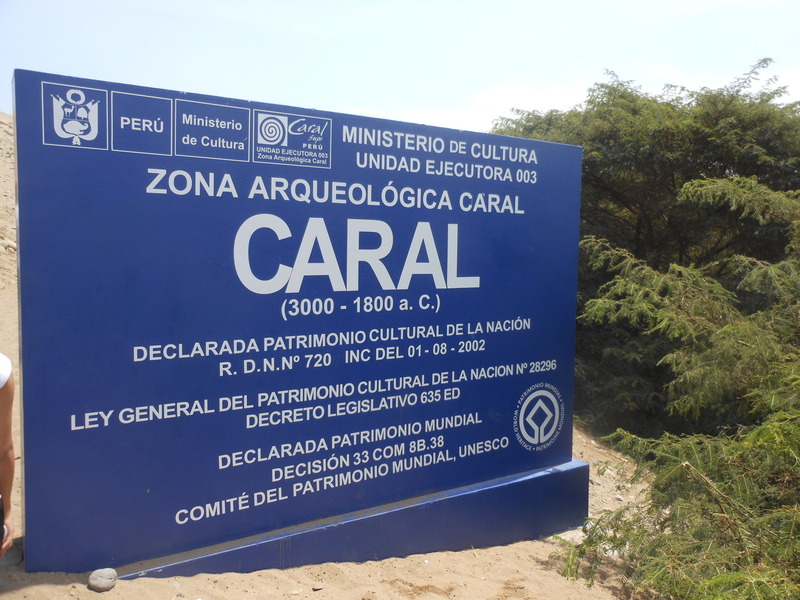 Caral is located in a desert. This should help you understand why all the next series of pictures are rather bichromatic (tan bottom half / blue upper half). We were assigned a guide as that is the only way to tour Caral. There are no free-range tourists at this site. As there are no ropes, fences, string, or any other barriers to keep the crowds off the ruins, having an ever-present guide is a good way to keep the rocks where they have been for the past five millennia. 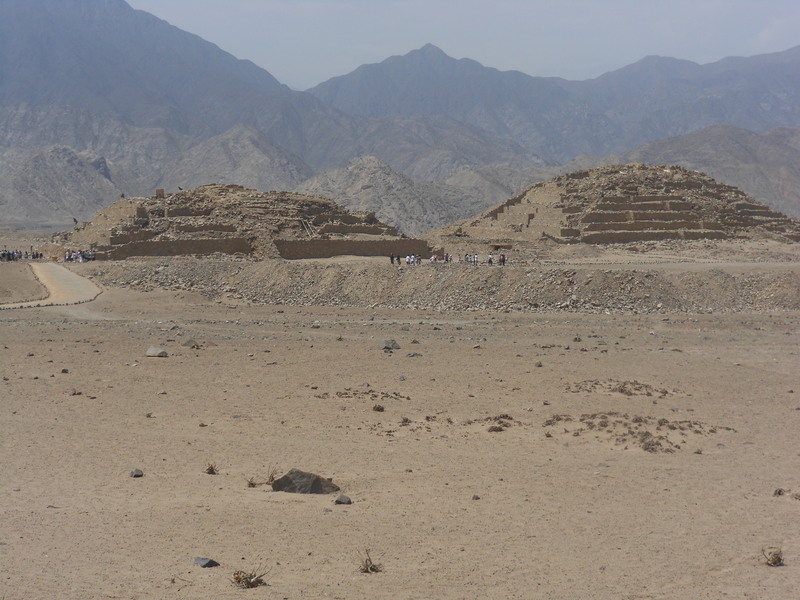 The highlight of Caral are the pyramids which may even be older (but not larger) than the pyramids at Giza. After a ninety-minute tour of the ruins, we were done. We knew we had completed our journey when we saw the sign thanking us for our visit. Politeness is always appreciated when one is dusty, hot, and thirsty. And, yes, the exit here does drop you off at the gift shop / refreshment center.